I dread being invited to parties, as someone who hasn’t had a drink in a few years it’s often a struggle to tolerate the people, the noise and the general tiredness that comes from being expected to stay out. Some of this is down to me just getting older but mostly it’s because I’m an anti-social grump who doesn’t like humans. This just meant that the pitch for Party Hard sold me instantly; a guy is awoken by a loud party next door and goes crazy and murders everyone. What’s not to like? From a top down perspective you must guide your little pixel man through various parties and social gatherings murdering everyone in attendance, mostly you’ll rely on your trusty sharp knife to take people out with a quick stab, but for better efficiency you must go around poisoning food, starting fires, setting explosives and starting cars to speed over groups of party goers. All the while you must be hiding bodies lest you want an attendee to spot the corpse and call the police, if you’re spotted over a body when it’s found then you’re ear marked for the police instantly and must outrun them. Outrunning the police isn’t actually an option as they move faster than you, instead you must just be awkward and jump through windows and round objects until the police just give up, each time they’re called though their tolerance for your crap decreases leading to tougher escapes. 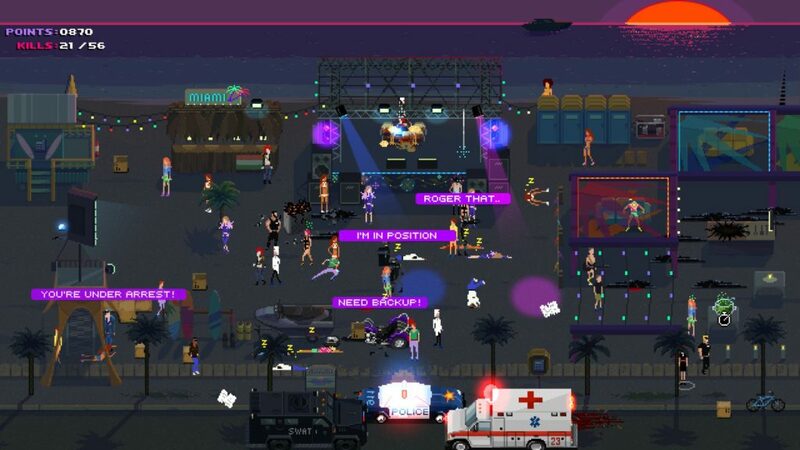 Party Hard suffers from many issues that hold it back from being a must play game. Firstly the sheer lack of help from the game; this is a tough game, it took me dozens of attempts to get past the first level. You’re given a brief tutorial on the buttons, but not what the game expects or needs from you or how you are to achieve the goal. Once you finally work out the requirements to finish a level you then have to contend with random level elements but also randomly generated events. Most egregious of these was when after many attempts I was down to my last 3 people of 56 on a level that needed to be “dealt with”, at which point a Jason Voorhees knock off turned up and killed me, I couldn’t attack him, I couldn’t hide and he moved faster than me. Things like this make it hard to define Party Hard, the game paints itself almost like a stealth puzzle game, but with the traps changing every run you can’t work out tactics, instead every run has to be a blind perfect run; this is not always conducive to fun. The music in the game starts off being really cool retro new wave synth affair that is nice for setting the mood, the unfortunate part is the each level features a single song, as such it just loops and loops and loops until you can’t stand any note featured, it grates to an amazing level that makes you wonder if this game is actually an experiment to see how much the player can take. There can’t be any denial that Hotline Miami in one form or another was an inspiration for Party Hard, whether it’s the neon 80’s, the violence or the confusing story elements. Unfortunately Party Hard hasn’t realised one of Hotline Miami’s strongest points, the instant restart. When you’re brutally taken out in Hotline Miami it’s easy to think “oh one more try” when you just press one button straight away and you’re back in the action. 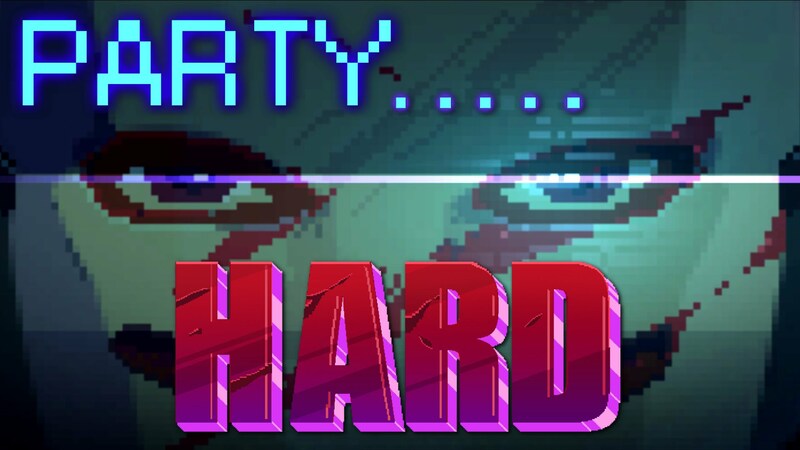 With Party Hard you must sit through a cop carrying your body to the police car and then a GTA 1 style BUSTED or DEAD appear on the screen, then a short loading point before you get another shot at wiping every one out. When you have to wait to retry it’s a lot easier to get the video game equivalent of self-intervention and realise you need to stop playing for a bit. 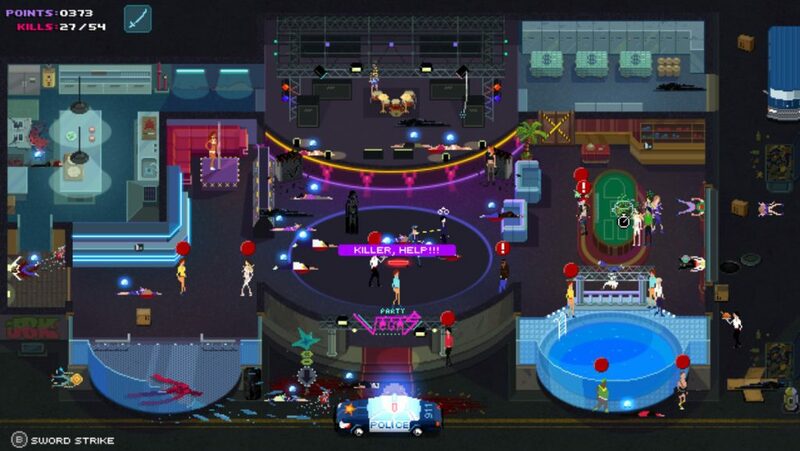 Party Hard is a conflicted game, it wants the extreme speed aspects of something like Hotline Miami but also a slow-paced puzzle game where you must consider all steps and winging it generally won’t work out well. Throw into the mix the random level set up and random game elements like a drug bust happening mid-level and all in all you’ve got a stressful experience. I haven’t sworn at a video game as much as I have with Party Hard, the levels of anxiety brought out were mostly unpleasant. I want to use this as praise for the game but in reality it was frustration rather than tension. I’ve gone to YouTube and watched people ace levels in no time so there is obviously a learning curve and an attainable skill level, but the steps you have to go through to get there are akin to a child learning Dark Souls. There’s fun jokes, the humour is there and the random elements can be entertaining when they’re not being detrimental to your run. The game requires a certain mind-set, a mind-set I worry that the majority of players are going to really struggle to get into. It’s a game I want to return to and get better at, but randomness does not make this an easy prospect. If there was difficulty setting then this would be an instant recommendation for me. The game is like a top down Hitman game where experimentation with items and traps can be a joy to discover but without a bit more freedom to learn and experiment the game is hamstringing itself and pulling away from the audience.